Lynn Ahrens (book and lyrics), one half of the Tony-winning Broadway composing team with Stephen Flaherty (music), who are celebrating their 35th year of collaboration, delights in reminiscing about the origin of their 1990 musical Once On This Island, now back on Broadway at Circle in the Square in a jawdroppingly sumptuous staging that pumps new life – and magic – into an already exhilarating work. “It was May 1988 and Stephen and I had just completed the run of our first Off Broadway show at Playwrights Horizon, Lucky Stiff. It was an incredible experience, and we wanted to start another project right away. I went hunting for ideas in a Barnes & Noble. Back then, they had a used section. 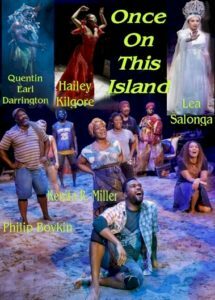 Once On This Island premiered in May 1990 at Playwrights and in October transferred to the intimate Booth on Broadway, one of the earliest shows to be performed without an intermission. It ran 13 months and just shy of 470 performances, starring LaChanze [in her third show and first lead role] and garnering her a Tony nod. Next, she had the lead in Ahrens and Flaherty’s Dessa Rose, co-starred with Once On This Island revival co-star Kenita R. Miller, at LCT’s Mitzi Newhouse. When there was interest in reviving Once On This Island by lead producers Ken Davenport and Hunter Arnold, Ahrens and Flaherty met with director Michael Arden (Deaf West’s Spring Awakening). His idea was to do the show in the round. Flaherty was poised to start all over with new orchestrations. AnnMarie Milazzo (Spring Awakening, Finding Neverland, If/Then) collaborated with original orchestrator, two-time Tony winner, Michael Starobin (If/Then, Next to Normal, Assassins, Sunday in the Park with George, My Favorite Year, Falsettos), age 90. “Michael (Starobin),” recalls Flaherty, “had an offbeat idea. Much of the castoff debris could be made into musical instruments. There was something quite profound about creating something of beauty from trash (such as percussion instruments, a wind machine crafted from a trashed bicycle, a xylophone made from shards of glass, and an ocarina made from a bottle).” Music supervisor Chris Fenwich made good use of everything. In addition, he gets an amazingly full sound from his five-member band. The Circle is a challenging venue to light. Standard grids would blind audiences on the four sides. Fisher and Eisenhauer installed overhead lighting, which solves that problem, and some non-intrusive side lighting. As the audience enters, they see water lapping onto a Caribbean island village shattered by the type of tempest wreaked by recent Hurricanes Irma and Maria. Peasants “with their brown skins,” amid displaced chickens and a goat, wade through sand and debris gathering what they can. Cast members do clean-up tasks and interact with audience members. Camille A. Brown, making her Broadway debut, has created energetic choreographic movement throughout [often to the point of audiences being unaware] and African dance traditions that are true to time and place. In these frigid temps, the one tropical place to be is at Once On This Island. The only persons not thrilled with the show are those on the clean-up crew. There’s a ton of sand from the Jersey Shore, hauled in daily, with cast members traipsing through it and water, it creates muck that is spread everywhere. Then, audience members track it on the stairs. 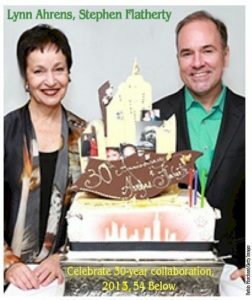 Kismet brought Lynn Ahrens and Stephen Flaherty together in 1982. He arrived from the Midwest and was accepted into BMI’s prestigious Lehman Engel Musical Theatre Workshop. She was an ad agency copywriter, jingle writer/singer and wrote for Disney’s TV series Schoolhouse Rock! She’s been nominated for four Emmys – winning the Outstanding Children’s Informational/Instructional Programming Award for H.E.L.P – Dr. Henry’s Emergency Lessons for People (1979). Soon, she thought of writing for theater and was accepted into the BMI workshop. The score hasn’t been lost. In several club engagements, they’ve done tunes from the musical; and from their 2014 Kennedy Center production of Little Dancer, set against the harsh backstage world of the Paris Opera Ballet, where the ballerina posing for Edgar Degas’s sculpture suddenly becomes the world’s most famous dancer. Though Ahrens is happily married and Flaherty happily partnered, both agree that their long collaboration relationship has been nothing short of a mutual love affair. Ahrens hesitates to mention Flaherty’s best and worst traits. “He’s a wonderful person. As a composer, he has great flexibility of style and sensitivity to lyrics.” Then, she ribs him. “If there is a worst trait it’s how he falls madly in love with everything he writes, whether it works or not. And, sometimes, it just doesn’t.” He attempts a weak smile. They’ve won eight Tony nominations and an Olivier for Best Musical for the original Once On This Island; Tony and Drama Desk Awards and received two Grammy nominations for Ragtime; Drama Desk and Grammy nominations for Seussical; and five Drama Desk nominations, including Best Musical, for LCT Off Broadway production of The Glorious Ones. They also received two Oscar and Golden Globe nominations and Gold Record status for their songs and score of the animated feature Anastasia, now expanded and a Broadway hit. And a not- so-good-time: the sadly short-lived musical adaptation of Sylvester Stallone’s Rocky, which has a book by the late Tony-winning Thomas Meehan (The Producers, Annie) [which was challengingly translated into German for its premiere]. The duo’s Broadway and Off-Broadway credits include Chita Rivera: The Dancer’s Life, A Man of No Importance; Dessa Rose (Drama Desk nomination); My Favorite Year; and Lucky Stiff (Washington area’s Helen Hayes Award, Best Musical). The composers are 2015 inductees into the Theater Hall of Fame. They’ve also co-chaired the Dramatists Guild Fellows program for emerging writers.